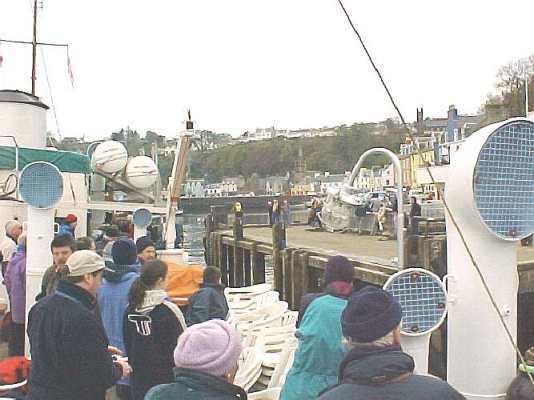 Passengers from Oban and Glasgow joined others on Balmorals 5 day West Highland package tour, Commodore Ticket holders and a special party from the Clyde River Steamer Club for the 10am departure from Oban. Unfortunately the bright sunshine of Friday (and the subsequent week) deserted us for Balmorals first passenger carrying sailing north and west from Oban through the Sound of Mull - although the ship had passed through that channel previously on positioning runs between the east and west coasts of Scotland. After passing Csledonian MacBraynes Mull carry ferry Isle of Mull in Oban bay there was little other shipping to be seen as we crossed the Firth of Lorne, passing between the lighthouse on Lismore and the light on the infamous Lady Rock which claimed many an unsuspecting vessel in former times. 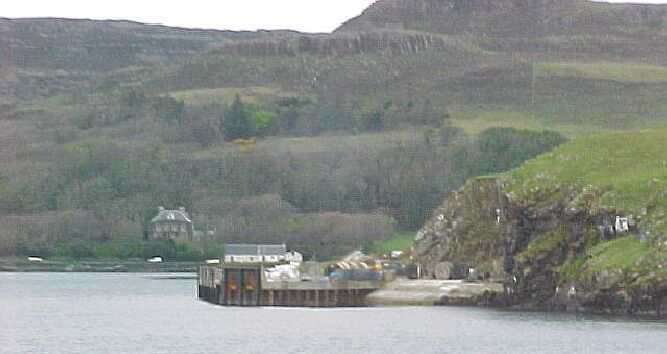 Passing the fortifications of Duart Castle, seat of the Chief of Clan MacLean, Balmoral entered the Sound of Mull, holding her course up the middle of the sound, the ferry Loch Fyne on the run between Lochaline and Fishnish as she progressed steadily towards the Mull capital of Tobermory. About 2 hours after leaving Oban, Balmoral swung to port round the north end of Calve Island and pulled up alongside the steamer pier of Tobermory, her first call at the town well known for its colourful buildings around the bay. 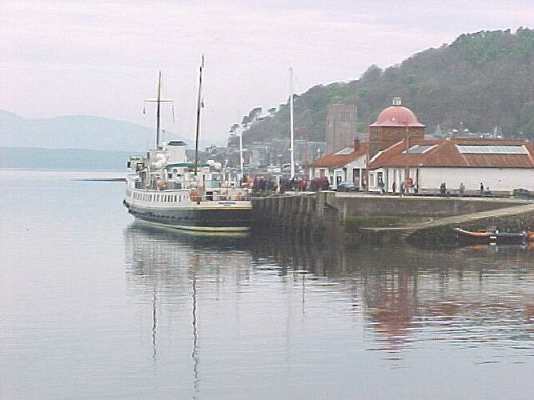 Unfortunately, there was no sunshine to brighten the photos of Balmoral at Tobermory, unlike the warm sunny day when Waverley made her first call there in June 1983. 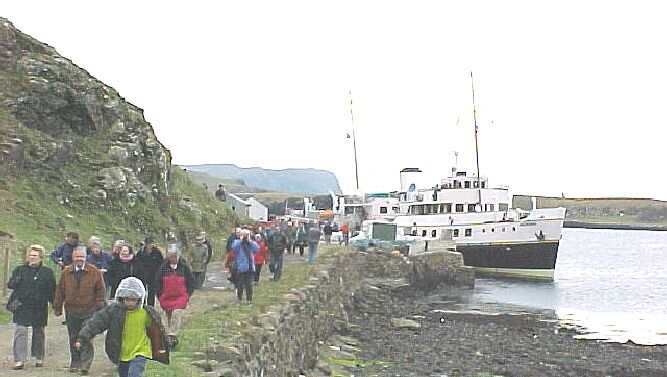 As Caledonian MacBraynes larger ferries no longer call at Tobermory, Balmorals call looks certain to be the only one by a sizeable vessel in 2000. A few Mull residents joined Balmorals complement swelling it to over 300. As Balmoral swung round the distinctive little lighthouse at Rubha nan Gall, pointing her bows out past the more famous lighthouse at Ardnamurchan (the most westerly headland of the British mainland), she encountered the Caledonian MacBrayne car ferry Loch Riddon, inward bound from Kilchoan to Tobermory. 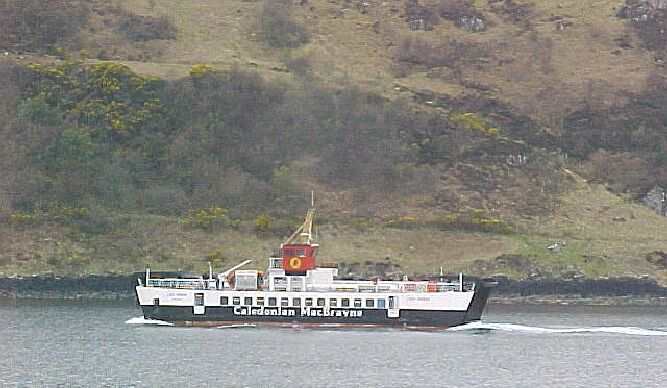 The last time that the two vessels met the Loch Riddon was engaged on her original duties across the Kyles of Bute from Colintraive to Rhubodach but she now spends most of her time on the services to Kilchoan and Lismore. As Loch Riddon passed astern we noted the much larger car ferry Clansman entering the north end of the Sound of Mull inward bound from the islands of Tiree and Coll to Oban. 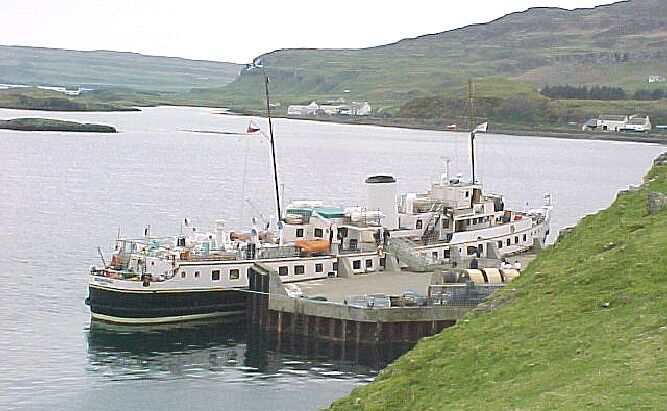 The two vessels passed in fairly close proximity not far from the place where Waverley and Clansman had passed for the first time a year to the day earlier. Rounding Ardnamurchan (the Point in the Ocean) Balmorals course was more westerly than that normally followed by Waverley in those waters for she was headed out to the west of the islands of Muck and Eigg in the little archipelago known as the Small Isles. 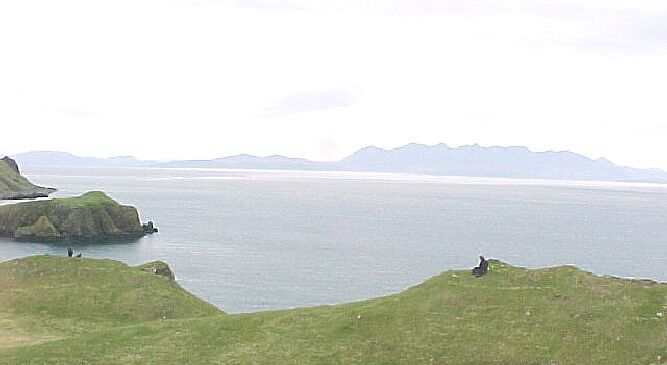 Sailing north through the Sound of Rum Balmoral held close to Rum, the largest island in the group and visible over many miles due to its high peaks which have Nordic names - Hallival, Askeval and Kinshival. 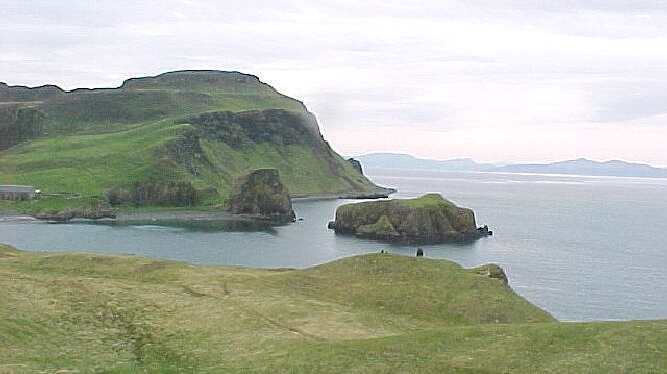 To the east lay Eigg with its prominent Sgurr peak - less characteristic from the west than it is when viewed from the east. Balmoral crossed the mouth of Loch Scresort on Rum around which the principal settlement shelters from the westerly gales of winter - and summer! At least the seas were very calm for Balmorals visit. At the head of the loch we could make our the rather incongruous bulk of Kinloch Castle, home of the one time owners of Rum, the Bullochs of Yorkshire. 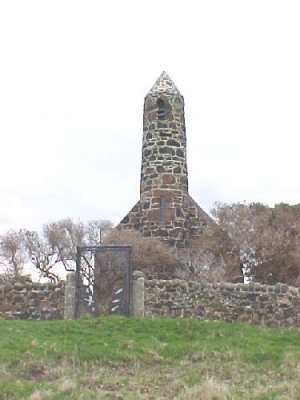 The red sandstone for the castles masonry was imported from the island of Arran by puffer. Also obvious in Loch Scresort was the preliminary work on the new terminal to be used by the new purpose built Caledonian MacBrayne ferry Lochnevis, which was then under construction at the Ailsa shipyard at Troon. 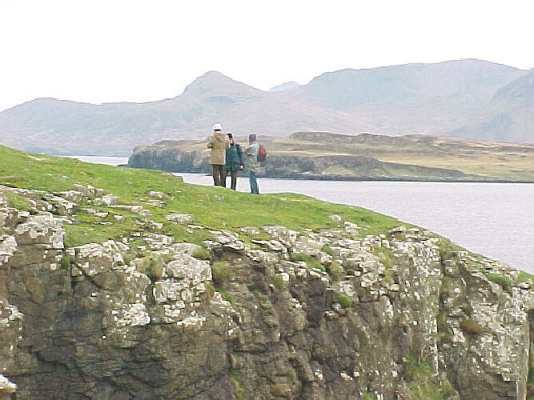 Rounding Rums northern point, Rubha Shamhnan Insir, Balmorals passengers had their first complete view of their ultimate destination that day - Canna, the most westerly of the Small Isles group. Despite the overcast skies the cloud levels were high and a vast panorama of the Scottish mainland and islands was visible - to the east we could see as far as the snowy white summit of Ben Nevis, to the west we could see the peaks of Hecla and Beinn Mhor on the Outer Hebridean island of South Uist, home of those stalwarts of Waverleys deck crew for many years, the late Roddy McIssac and the late Donald McKinnon. To the North - the spectacular expanse of the Isle of Skye from Bla Bheinn (Blaven) and the Red Cuillin over Loch Scavaig to Healabhal Mhor and Healabhal Bheag (MacLeods Tables) above Idrigill Point on the far shore of Loch Bracadale. In the middle of the panorama the incredible peaks of the Black Cuillin, at that time subject of a controversial sale plan by its owner, MacLeod of MacLeod, chief of the clan. 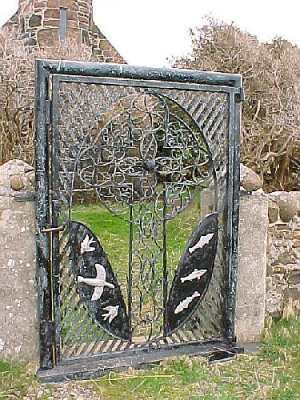 The asking price of £10m was to assist the renovation of Dunvegan Castle, the Clan Chiefs ancestral home. 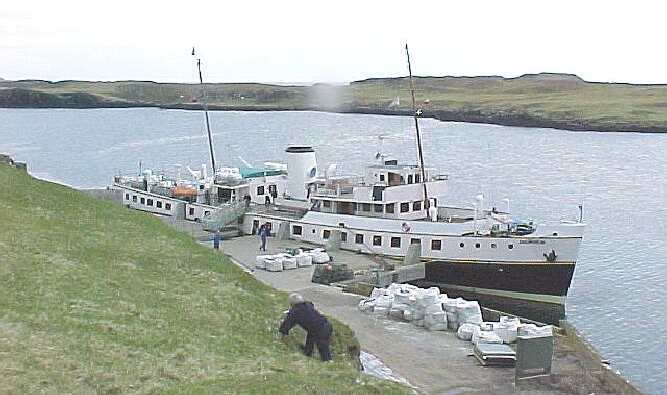 Slightly ahead of schedule Balmoral pulled into Canna Harbour, a sizeable natural anchorage formed by the main island and the close lying isle of Sanday. 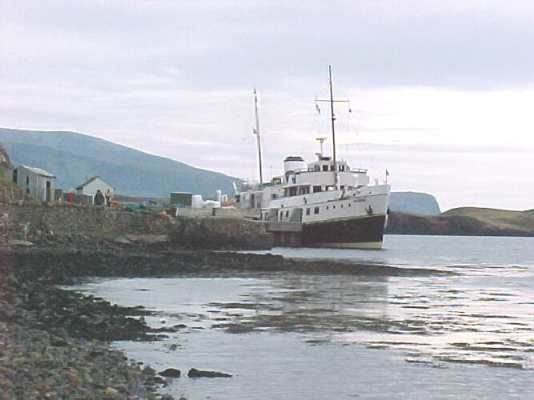 Canna is the only one of the Small Isles to possess a proper steamer pier and it receives calls by many different vessels. 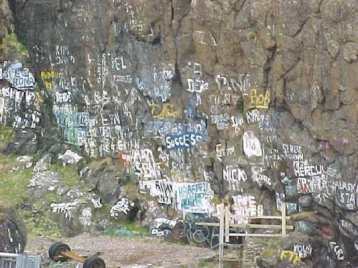 On a rock face opposite the pier a vast wall of ships names has been painted. Anywhere else this somewhat unsightly edifice would be condemned as graffiti but in context in Canna it is just about acceptable. 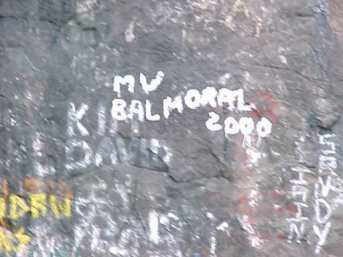 In any case it seemed appropriate for Balmoral to sign the visitors book and so MV Balmoral 2000 was added to the Canna rock face for posterity. Balmorals passengers flooded ashore, out-numbering the island population by about 15 to 1. There were plenty attractions - photographing Balmorals first visit to Canna from a multitude of angles, visiting the diminutive island shop, flag bedecked for the day, which must have sold a few months supplies of souvenirs within an hour, visiting the distinctive church with its magnificent wrought iron gate, climbing to the summit of Compass Hill and contemplating the superb view of the Black Cuillin from Rubha Chairinis. The view of the peaks of Bla Bheinn, Sgurr nan Eag, Sgurr nan Gillean, Sgur Alasdair and others was awesome - £10m could not buy that view. There was not enough time to visit the disused church of St Edward over on Sanday - the historic building was being converted into a college of Gaelic studies.